Can the city of Dayton be liable for a car wreck caused by roadway debris? In order to get the answer to this question a lawyer looks at statuatory law and case law interpreting the statue. Under R.C. 723.01 a municipality (city) must keep it’s streets from from nuisance. If the City did not create the condition then the city must have notice of the condition and time to fix the problem in order to be responsible. snap the steering suspension and cause a car to go out of control . 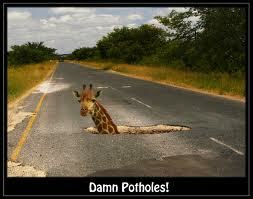 The mere impact with the pot hole can also cause a car wreck. Another common problem is malfunctioing traffic lights such that cars meeting at intersections both have the green light. One unusual case that I was involved with dealt with a construction site. Often these sites are controlled by the Ohio Department of Trasportation a state agency. Claims against the state must be brought in the Ohio Court of Claims. So it is important to determine which governmental entity has jurisdiction over the area where the accident occurred. The case I am speaking about dealt with black out tape being used to temporarily cover the yellow fog line. The tape became slick within 30 days but was left out there over a year. A motorcyclist lost control because of the slick tape and was killed. Although within the city limits the issue was not nuisance but active negligence on the part of ODOT and the contrator Kokosing as well as the tape manufacturer.